Transplanting a dogwood tree from the wild can be a difficult, according to North Carolina State University. Wild dogwoods are often poorly shaped and may have an unevenly developed root system. Survival of wild dogwoods that are transplanted is usually very low, and special care must be given to these trees to ensure their survival. 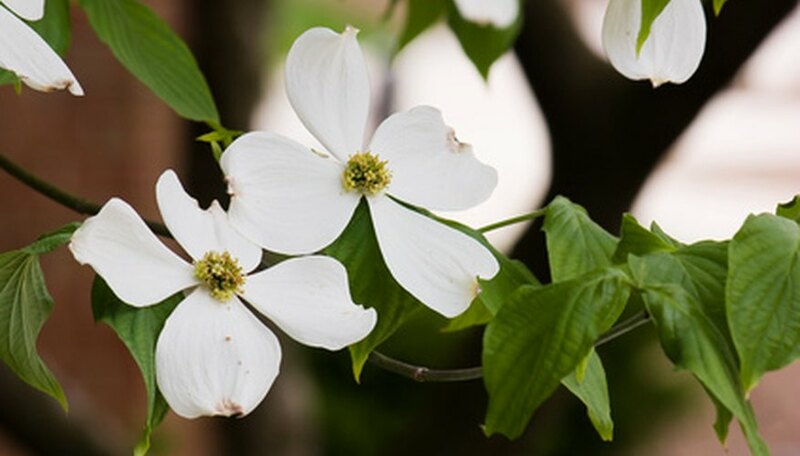 Though most people prefer to purchase dogwood trees that have been grown from seed in a nursery, you can attempt to transplant a wild dogwood tree. Select a wild dogwood specimen with a trunk that is less than 1 inch in diameter. Calculate where you will dig your tree’s root ball. Measure the trunk’s diameter with a caliper at a point 6 inches above the ground. The root ball should be 12 inches thick per every inch of thickness in the tree’s trunk. Root prune the tree one year before you transplant it by inserting a sharp spade into the ground in a circle around the tree. This will cut the roots. The spade should be inserted into the ground at a point that is 2 to 3 inches inside of the point where you plan to dig up your tree. Leave the tree undisturbed for one year. This will allow feeder roots to develop, which will help the tree survive when it is moved. Time your transplant for early spring while the tree is still dormant. Insert a shovel into the ground in a ring 2 to 3 inches beyond the point where you root pruned the tree the previous year. Slip the shovel under the root ball and tilt the handle back to lift the root ball from the ground. Place the root ball into the center of a large square of burlap. Lift the burlap around the root ball and pin snugly around the trunk of the tree. This will prevent a loss of soil around the roots. Dig the planting hole for the root ball that is slightly larger than the root ball, but no deeper. Unwrap the burlap and place the root ball into the planting hole. Fill in the sides of the planting hole with soil and slightly cover the root ball. Layer 3 to 4 inches of mulch around the tree to hold in moisture, and prevent weeds and grass from becoming established. Water newly established dogwoods twice weekly in spring and fall for the first two years after transplanting. Do not take dogwood trees from state parks or national forests. Plants in these locations are protected by law. Instead, select wild dogwood specimens from private land where you have the owner's permission to dig up the plant. Do not fertilize your dogwood tree. Dogwoods grow in the wild in poor soil. Fertilizing your dogwoods can stunt the development of roots.